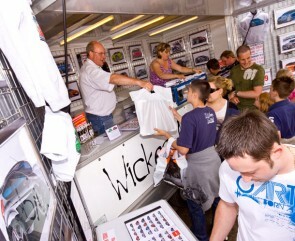 Wicked Artz Cartoons has been selling it's fantastic range of cartoon car pictures since 1997. We now offer a huge and varied selection of cartoon cars taken from original hand drawings by the UK's top motor cartoonist, Carl Greatrix and great computer rendered car cartoons by Duc K from Croatia. We attend Show's and Exhibitions throughout the year from major events such as Autosport International at NEC Birmingham and also much smaller, one day car shows aimed at enthusiasts, where our complete range of cartoon cars can be viewed and purchased from our large mobile exhibition trailer. Classic Ford Show, Santa Pod Raceway.